Wildlife v Oceans – emotions versus information? WWF’s ‘They can’t go on without you’ uses vivid imagery backed by an appropriate song to communicate the plight of Wildlife in one ad, and Oceans in another. But while the styles are very similar, the responses are quite different. Wildlife tugs on our heartstrings in a way that Oceans does not. But Oceans have us encoding more to memory than Wildlife does. Does the increased Connection scores in Wildlife underline the emotional resonance of big animals? After all, no one grows up with a stuffed ocean as a toy. But then, why isn’t this encoding to memory more? Why instead do we see more of Oceans encoded to memory? How might it be possible to use the emotional resonance of big mammals with the tendency to encode more ocean imagery to memory? Opening images of the wildlife draw peak Connection which is mostly sustained above benchmark for the duration of the spot backed by a song that underlines the key message. 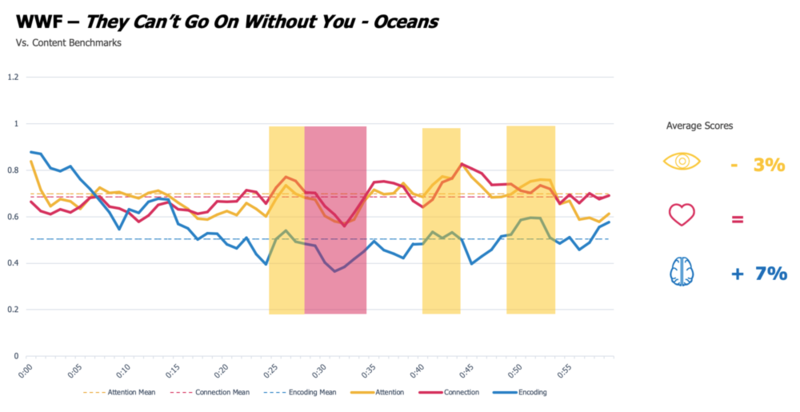 Connection’s second highest peak comes – alongside rises in Attention and Encoding - on the final call to action – “They can’t go on without you”. Join Us. A swimming seal and manatees sink scores. Earth Month: The Bus. From GO. The GO Bus.